242 pages | 13 B/W Illus. In cities around the world, digital technologies are utilized to manage city services and infrastructures, to govern urban life, to solve urban issues and to drive local and regional economies. 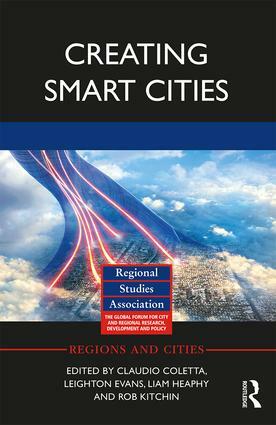 While "smart city" advocates are keen to promote the benefits of smart urbanism – increased efficiency, sustainability, resilience, competitiveness, safety and security – critics point to the negative effects, such as the production of technocratic governance, the corporatization of urban services, technological lock-ins, privacy harms and vulnerability to cyberattack. Included are case studies from Ireland, the United States of America, Colombia, the Netherlands, Singapore, India and the United Kingdom. These chapters discuss a range of issues including political economy, citizenship, standards, testbedding, urban regeneration, ethics, surveillance, privacy and cybersecurity. This book will be of interest to urban policymakers, as well as researchers in Regional Studies and Urban Planning. Claudio Coletta is research manager in the Urban Studies Institute at the University of Antwerp. His research focuses on urban phenomena at the intersection between technology, narratives and practices. His current interests address algorithms and automated urban management, the temporal dimension of smart cities development, and experimental urbanism. Leighton Evans is a Senior Lecturer in Media Theory at Swansea University. His research focus is on phenomenology and digital media, with interests in locative media, virtual and augmented reality, the experience of labour in data intensive environments and the subjective experience of technological implementation. Liam Heaphy is a postdoctoral research fellow in the School of Architecture, Planning & Environmental Policy at University College Dublin. His research draws on science and technology studies, planning, architecture and history to examine the relationship between urban science and urban form, with a particular focus on sustainability and spatial planning. Rob Kitchin is a professor and ERC Advanced Investigator at the National University of Ireland Maynooth. He is principal investigator of the Programmable City project and the co-PI of the Building City Dashboards project. He has published widely across the social sciences, including 26 authored/edited books and over 180 articles and book chapters.